Kirk Goldsberry has been a contributing writer for Grantland since 2013, while continuing his work as a visiting scholar at Harvard University. 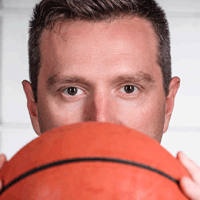 Goldsberry has an expertise in spatial and visual analytics, and his cutting edge research has made him a big name within the basketball analytics community. Goldsberry received his Ph.D. from the Department of Geography at the University of California, Santa Barbara in August 2007. From there, he became a professor at Michigan State University where he taught for 6 years. Currently, he is a visiting scholar at the Harvard Institute for Quantitative Social Science, as well as full time staff writer atGrantland.com. Goldsberry’s research primarily focuses on the visual dimensions of analytical communication. From this research, he has been successful in examining the NBA through his ongoing project, CourtVision Analytics, which evaluates basketball performance via spatial and visual modalities. In particular, his interests are on the links between visual form, graphic design, and spatial reasoning. His research has been presented multiple times at the MIT Sloan Sports Analytics Conference. Goldsberry graduated from Pennsylvania State University in 1999 with a degree in Earth Sciences, Geography. He then went on to earn his Master’s degree in Geography in 2004 and Ph.D. in Geography in 2007, both from the University of California, Santa Barbara. Goldsberry currently resides in Austin, Texas.